Some 1500 varieties of papers sourced from around the globe are inventoried at Hollander’s in Ann Arbor, Michigan. That pretty much makes it the United Nations of decorative papers. Hollander’s is the kind of store you could spend hours in, getting lost among the aisles of art supplies, stationery, gifts, and most astoundingly, racks and racks of papers from every corner of the globe: Italy, India, Philippines, Japan, France, Egypt, Thailand, Korea, Nepal, Portugal, the US, and more. There are Unryu papers, Florentine marbles, Chiyogami, Italian woodblocks, embossed and flocked papers, metallic sheets, corkskin and tissues and laces made from hemp, rayon, and kozo. Hollander’s has made decorative papers and bookbinding supplies the focus of their business, and over the years, they have built one of the largest collections of both in the country. Tom and Cindy Hollander began their business in 1986 selling handcrafted boxes and desk accessories from their home. They opened the retail store in downtown Ann Arbor in 1991. An online store followed soon after. But you might say Tom Hollander grew up in the business. As a teen, he was recruited into his mother’s home-based business of handcrafting boxes and books. What began as a cottage industry has blossomed into a thriving retail store and online business. Hollander’s stocks about 200 of Rossi’s decorative papers occupying several racks within the store. Tom said, “When we had the opportunity to visit Italy a few years ago, we toured the Rossi operation firsthand. After importing these decorative papers for so many years, it was quite a thrill to see them being created and produced,” he added. Since 1994, Hollanders School of Book and Paper Arts has been nationally recognized for its workshops and high quality instructors. Over 1000 workshops have been conducted since it opened, and they continue to be a great resource for those involved in book creation. Kris Stewart, a bookbinder and Hollander’s customer from Washington state, agrees: “Hollander’s is an excellent resource. They carry a unique selection of decorative papers, some that I can’t find anywhere else, especially in the Florentine Prints and Italian Woodblock categories. And they have a nice assortment of bookbinding and crafting tools, too. I only wish I lived nearby!” she added. 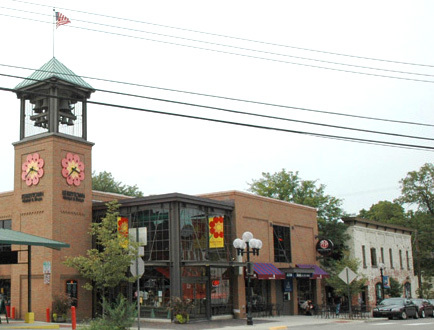 Hollander’s is located in the Kerrytown Mall in downtown Ann Arbor. If you’re in the area, a visit to Hollander’s is well worth it. Just plan for a long visit!